Facebook Values … Has the little boy spoken? Facebook has lost ca. 450+ Million US$ per day since its IPO … or about 40 Billion US$ … in a little under 90 days (i.e., reference date 17-08-2012). This is like loosing an Economy such as the Seychelles every second day. Or a Bulgaria in less than 90 days. (Note: this is not to say that you could buy Bulgaria for $40B … well who knows? 😉 … the comparison just serves at making the loss of Facebook value more tangible. Further one should not take the suggestion of a relationship between market value of a corporation such as Facebook with GDP of country too serious as also pointed out by Dean Bubley @disruptivedean). That’s a lot of value lost in a very short time. I am sure Bulgarians,”Seychellians” and FB investors can agree to that. 40 Billion US Dollar could keep 35 thousand Americans in work for 50 years each! So has the little boy spoken? Is the Emperor of Social Media Naked? Let’s have a more detailed look at Facebook’s share price development since May 18th 2012. The Chart below shows the Facebook’s share price journey, the associated book value, the corresponding sustainable share of Online Ad Spend (with an assumed 5yr linear ramp-up from today’s share) and the projected share of Online Ad Spend in 2012. In the wisdom of looking backwards … is Facebook, the Super-Mario of Social Media, really such a bad investment? or is this just a bump in a long an prosperous road ahead? I guess it all rise and fall with what ever belief an investor have of Facebook’s ability to capture sufficient Online Advertisement Spend. Online Ad spend obviously includes the Holy Grail of Mobile Ad Revenues as well. FB’s revenue share of Online Ad Spend has raised steady from 1.3% in 2009 to ca. 5% in2011 and projected to be at least 6% in 2012. Take a look at FB’s valuation (or book value) which at the time of the IPO (i.e., May 18th 2012) was ca. 80+ Billion US Dollars. Equivalent to a share price of $38.32 per share (at closing). In terms of sustainable business such a valuation could be justifiable if FB could capture and sustain at least 23% of the Online Ad Spend in the longer run. Compare this with ca. 5% in 2011. Compare this with Googles 40+% om 2011. AOL, which is Top 5 of best companies at conquering Online Advertisement Spend, share of Online Ad Spend was a factor 15 less than Google. Furthermore, Top-5 accounts for more than 70% of the Online Ad Spend in 2011. The remaining 30% of Online Ad Spend arises mainly from Asia Pacific logo-graphic, politically complicated, and Cyrillic dominated countries of which Latin-based Social Media & Search in general perform poorly in (i.e., when it comes to capturing Online Ad Spend). Don’t worry! Facebook is in the Top 5 list of companies getting a piece of the Online Advertisement pie. It would appear likely that Facebook should be able to continue to increase its share of Online Ad Spend from today’s fairly low level. 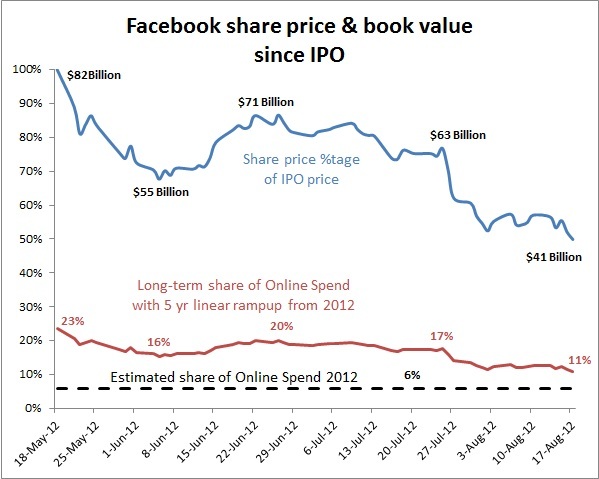 The above chart shows FB’s current share price level (closing 17-August-2012) corresponds to a book value of ca. $40 Billion and a sustainable share of the Online Ad Spend of a bit more than 10+%. It would be sad if Facebook should not be able to ever get more than 10% of the Online Ad Spend. A Facebook share price below $20 does seem awfully cheap! Is it time to invest in Facebook? … at the moment it looks like The New Black is bashing Social Media! So the share price of Facebook might drop further … as current investors try too off-load their shares (at least the ones that did not buy at and immediately after the IPO). Facebook has 900+ Million (and approaching a Billion) users. More than 500+ Million of those 900+ Million Facebook users are active daily and massively using their Smartphones to keep updated with Friends and Fiends. In 2011 there where more than 215 Billion FB events. Facebook should be a power house for Earned and Owned Social Media Ads (sorry this is really still Online Advertisement despite the Social Media tag) … we consumers are much more susceptible to friend’s endorsements or our favorite brands (for that matter) than the mass fabricated plain old online advertisement that most of us are blind to anyway (or get annoyed by which from awareness is not necessarily un-intended ). Maybe the Little Boy will not speak up as the Emperor is far from naked! See my Social Media Valuation Blog “A walk on the Wild Side”. 2012 FB capture 6% of total online ad spend. FB gains a sustainable share of online ad spend X%. 5 yr linear ramp-up from 2012 6% to X%, and then maintained. Other revenues 15% in 2012, linearly reduced to 10% after 5 yrs and then maintained. Assume FB can maintain a free cash flow yield of 25%. This entry was posted on August 18, 2012, 12:27 am and is filed under Economics, Social Media. You can follow any responses to this entry through RSS 2.0. You can leave a response, or trackback from your own site. ทักทาย ! เป็นประโยชน์ มาก โพสต์ ! นี้ โพสต์บล็อก มันเป็น แรงบันดาลใจ เก็บไว้ในการ โพสต์ ! from this web site, and your views are pleasant in favor of new users.